GFCI vs AFCI - FAQ - United Electrical Contractors, Inc.
GFCI vs AFCI. What is the real difference between an AFCI and a GFCI or ground fault circuit interrupter? The principal distinction between the two is that a GFCI is designed to protect individuals from severe or fatal electric shocks while the AFCI is meant to protect against fires. 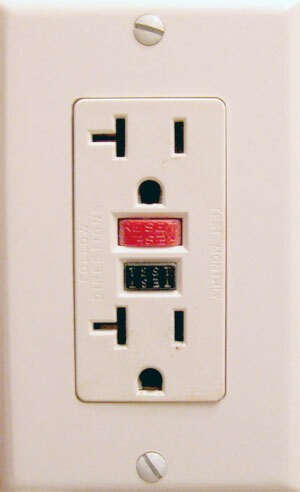 Certain unprotected outlets can spark into fires caused by arcing faults, which the AFCI is intended to prevent. The GFCI, on the other hand, can also protect against some electrical fires by detecting arcing and other faults to ground but cannot identify hazardous across-the-line arcing defects that can cause some fires. A ground fault is an unintended electric path diverting stray or even sudden current to ground. Ground faults occur when current is leaking from a circuit. Understanding how electrical flow leaks is significant. If a person’s body is what is providing a path to ground for this leakage, the person could be injured, burned, severely shocked, or electrocuted. The National Electrical Code requires ground fault protection for outlets located outdoors, in bathrooms, garages, kitchens, crawl spaces, unfinished basements, and at specific locations such as near swimming pools – basically where any wet or moist environments might be nearby. An AFCI and GFCI combination can be used to satisfy the NEC requirement for GFCI protection only if marked explicitly as a combination device. We get this question all the time. If you have any more questions or concerns regarding GFCI vs AFCI, please contact us below!